I love toys that teach my kids. I discovered these cool kits that teach kids how to be an entrepreneur. These fun kits give your children life skills while providing them an activity that allows them to earn some money. When I presented this kit to my younger boys, the younger one got excited about being able to make something and then sell it to earn some money. He could not wait to check out the contents in the kit. 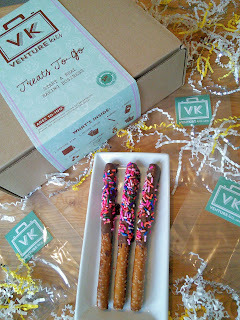 We received the Treats To Go kit and it included everything that my boys needed to start a business selling some treats. I liked that the kit had detailed step by step instructions on things like finding customers, taking orders, setting the price, and even recipes. 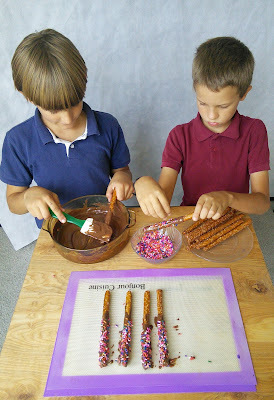 My boys and I chose to make some delicious chocolate covered pretzels. The boys decided that they would sell them to friends at church. How cool is this! I taught them about making the treats and selling them. I love stuff like this! Very neat. Looks like they had a great time making them!